An artist's impression of Holiday Villa Hotel & Residence City Centre Doha, Qatar, which will its soft opening in April. The global economic downturn may have put the brakes on some companies’ expansion plans but for Holiday Villa International Ltd, it opens the doors of opportunity to further build its hospitality business. The homegrown hotel management company recently signed management contracts in Vietnam and China and is preparing for similar ventures in other markets. Back home, the unit of Advance Synergy Bhd plans to add another asset which will be built within the Kuala Lumpur City Centre. “We are quite lucky as suddenly, we have a series of projects and offers coming to us when we thought this is supposed to be a recession year,” said Holiday Villa Hotels and Resorts managing director Datin Mavis Masri Azman. “I believe we fill a nice niche as some owners and developers prefer not to work with the superchain operators but are looking for an Asian hotel group which is small but with a very specialised management style,” she said. Holiday Villa started the year with the signing of a contract early last month to manage a 147-room hotel in Shenzhen, China. It also formalised a deal with Au Lac Quang Ninh LLC which will see the group taking over the management of four-star Tuan Chau Island Resort in Halong Bay, Vietnam. The 15-year contract starting February also involved renaming the three-year-old resort with 247 rooms and suites as Tuan Chau Island Holiday Villa Halong Bay. Speaking to a group of reporters before the contract signing ceremony in Halong Bay, Mavis said the economic downturn offered the group a leeway of six to 12 months to upgrade and reposition the Vietnam beach resort while promoting it abroad. “Despite the glut, we still have festive seasons and school holidays. In this trying time, it will be cheaper for people to travel within the region instead of going to Europe, for example. “So, there is still a market for us but the yield will be slightly different because the stay might be shorter. But I believe, for the next one to two years, we have to be practical,” she said. Mavis said that apart from upgrading some of the resort’s amenities, the group’s immediate plan was to promote it to domestic and regional tourists. Holiday Villa has a strong sales distribution network that includes sales offices and representatives in France, Britain, Indonesia, Japan, Singapore, Cambodia, the Middle East and soon, South Korea. It also has an online reservation system that provides instant room confirmation. “The markets for this Vietnam resort now are mainly China and South Korea but we plan to promote it to other Asian countries such as Malaysia, Singapore and Brunei. “We are also looking at major markets in Europe, especially France and Germany, as people from these areas like this kind of natural holiday environment,” she added. Located in the north near China’s border, Halong Bay was once a favourite holiday spot for President Ho Chi Minh. The World Natural Heritage Site is famous for its tranquil seascape of limestone pillars and emerald green sea. Mavis noted that when Holiday Villa took over a resort in Kuta Bali, Indonesia, in 2007, it was able to increase the occupancy rate from about 30% then to 70% now. “So, we are confident that in one to two years, we can add 20 to 30 percentage points to the occupancy rate of this Halong Bay resort, which now stands at 35% to 40%,” she said. The contract was Holiday Villa’s first in Vietnam and Mavis hopes it would unfold more opportunities for the group in that country. 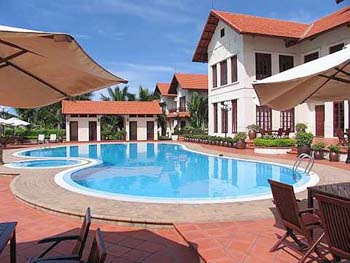 She noted that the owner of the resort had other hotel developments in Vietnam, including in Ho Chi Minh City and Hanoi. In fact, Mavis said, the group had been approached by another developer to manage a hotel in a city not far from Hualong. “But I told them to let us do it with one hotel first and do it well. Let us learn the ways and culture in Vietnam before we embark on a second hotel,” she said. Mavis said Holiday Villa had also signed a contract in December last year to operate a resort in Sihanoukville. The Cambodian operation with 80 rooms will have its soft-opening in July. “On top of that, we have our own hotel in Phnom Penh and we are looking at extending it because we still have vacant land there. We are now operating 80-over rooms and we intend to add 70 more,” she said. Holiday Villa also has the Middle East on its radar screen. Mavis said the group had signed a management contract to run a hotel in Doha, Qatar. To be known as Holiday Villa Hotel & Residence City Centre Doha, the property will offer 376 serviced residences and 358 rooms. The soft-opening is planned for April. According to Mavis, the group is in active talks with some parties to add about five more hotels to its chain. “Of the five, two or three will be in Malaysia, one in Cambodia and another in India. We expect to sign the deals in one to two years,” she said, adding that it was also studying some offers from Bahrain and Ghana. On the homefront, Mavis said Holiday Villa planned to build a four-star apartment hotel within the KLCC area. It hopes to start construction works by the year-end for completion in two years. “We are waiting for development approval. The project, which will comprise about 200 rooms and apartments, will not cost more than RM50mil,” she said. Holiday Villa International chairman Datuk Azman Shah Haron said the Vietnam island resort was the 20th property in the group’s portfolio and fitted well into its plan to establish its brand in key markets abroad. Of the 20, eight are its own assets and 12 run under management and licensing agreements. Azman said the group would invest US$1mil mainly in marketing, training and reservation system for the Halong Bay resort. It expects to recoup the investment in two years. “There will be intensive training programmes and cross-training opportunities for our Vietnamese staff to expose them to international working culture and hospitality,” he said. It will set up a halal food section at the resort to cater to the Muslim market. “We also plan to have a cultural food exchange. We will bring some talents from Vietnam to Malaysia and, at the same time, promote Vietnamese food and culture at our hotels abroad,” he added. Stockbroker and property developer TA Enterprise Bhd (TAE) plans to launch four projects worth RM2.5 billion over the next two years, unfazed by concern over a slower property market. The new projects include the RM1.5 billion Nova Square on 1.32ha of prime freehold land at the Jalan Bukit Bintang/Jalan Imbi junction, opposite the Dorsett Regency Hotel Kuala Lumpur. 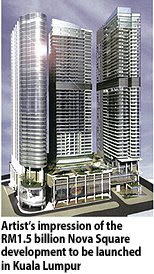 Nova Square will feature a five-star hotel, luxury residences, an office tower and a five-level podium. TAE deputy chief executive officer Tiah Joo Kim said that details of the project had been submitted to the relevant authorities for approval. Construction work will begin by early next year, two years later than the initial targeted deadline owing to the slowing economy. "We have had enquiries from foreign investors expressing interest in Nova Square. Discussions are in the preliminary stage," Tiah told Business Times in an interview. Three other projects, all in Kuala Lumpur and at the design development stage, comprise luxury townhouses and condominiums in the U-Thant area, a condominium development at Dutamas, and an integrated commercial project in Bandar Sri Damansara. Although there is a slowdown in the property market, Tiah does not expect prices to drop to levels seen in the US or the UK. "Local demand is in a transitional wait-and-see period as most of the investors or buyers are waiting to see the effects of the US recession, not just on the rest of the world but also our economy. "But there aren't any real signs of a credit bubble or cracks in the local economy as consumer spending, lending to purchasers and the employment situation are still healthy," he said. Tiah said the real test would be whether local developers could weather this period. TAE has three ongoing projects with a combined gross development value of RM690 million: Idaman Residence@KLCC; Damansara Idaman bungalow development; and Idaman Villas, a semi-detached villa development in Petaling Jaya. The projects were unveiled in 2005. The properties, which are near completion, are on average more than 80 per cent sold. According to Tiah, TAE has RM81 million in unbilled sales, which will be realised in its fiscal year ended January 31 2009, and in 2010. He said that its property division will be a significant contributor to TAE's revenue in the current year, surpassing its stockbroking division owing to the poor financial market conditions. PROPERTY developer Golden Corporate Heritage Sdn Bhd, which is investing RM35.4 million to develop an Arab City in Kuala Lumpur, hopes to get the authorities' approval for the project soon. "We hope to open this (development) before the coming Arab summer break. Once we get the approval, we can immediately start construction," managing director Hesham Fathi told Business Times. The company, a joint venture between Dubai, Saudi Arabian and Malaysian partners, has received the nod from the Tourism Ministry and is currently awaiting approval from the Land Office before it can start work on the development. The proposed Arab City development claims to be different from Ain Arabia, a street in Bukit Bintang which offers a string of Arab restaurants. "At Arab City, the food will be authentic Arab food cooked by chefs from the Middle East," Hesham said. The proposed site is located between Saloma Bistro and Zouk Club along Jalan Ampang, Kuala Lumpur. The 150,000 sq ft site will host 156 bazaars, convention centre, spa, saloon, 10 Arabic restaurants and a theme park. It is expected to provide job opportunities for about 1,000 Malaysians, while 200 Arabs are expected to run the business. "Even when travelling, the Arabs are not adventurous. They like their own food, so we are creating a place for them," he added. Apart from Kuala Lumpur, Golden Corporate plans to bring the Arab City concept to Malacca and subsequently to other states, inspired by those of Chinatown and Little India, which are available in most parts of the world.